The story of the engineering brilliance and human sacrifice behind the 93-year-old Panama Canal. Man has landed on the moon, CNN and the internet have given us instant access to world events, while mobile phones have made communications available any time, anywhere. Yet, one achievement, dating back nearly a century, still stands high and tall (or should we say wide and deep): the construction and opening of the Panama Canal. The waterway, which was formally opened in 1914 after 10 years of construction, today accounts for 5% of global ocean-going commerce, 12% of US ocean-going commerce and a growing share of booming US-China trade. In fact, the US and China are the top users of the 82km waterway. Each year, more than 12,000 vessels transit the canal, which links the Atlantic and Pacific Oceans. In total, more than 922,000 vessels have used the waterway since it opened 93 years ago. And all using the same basic technology as when the first ships used the canal to cross the isthmus. "That the locks at the Panama Canal are still working nearly 100 years later without any major problem is testament to the standard of design and construction employed," writes Matthew Parker in his extensive new book on the construction of the canal, Panama Fever: the battle to build the canal. The use of concrete was a daring gamble at the time, but it has stood the test of time. As Parker points out in this well-written historical overview, the canal was opened despite a series of major obstacles, ranging from financial and political uncertainty (especially under the French company that initially started the construction in 1880), diseases such as yellow fever and malaria, and accidents. In total, more than 6,000 workers died during the decade of US construction (1904-1914) alone, according to official figures. The construction had other negative consequences, including racial tension (most of the workers were from the West Indies, while the managers were typically white Americans). Parker also paints a critical picture of the legalities surrounding the basis for the US construction of the canal - Panama obtained independence from Colombia in 1903 in return for granting the US full control over the Panama Canal and its surrounding Zone (they were handed back to Panama in 1999 and 1979 respectively, as a result of the 1977 Torrijos-Carter treaty). Reading Panama Fever, one cannot help but see some interesting parallels. The US government spent $400 million to build the canal. In today's money, that is $5 billion - nearly the same amount that the Panama Canal Authority plans to spend on a seven-year expansion of the waterway, starting this year. Parker notes that the original plans by French diplomat and Suez Canal builder Ferdinand de Lesseps called for a width in the Panama Canal locks of only 61 feet, which would have been too small for the larger ships that sailed when the waterway finally opened. "It became increasingly apparent that the de Lesseps canal, had it been completed, would have been almost immediately obsolete," Parker writes. In the end, the canal was 110 feet wide. The width has again become a key issue, as an increasing number of vessels (so-called post-Panamax ships) are too large to pass through the waterway. Hence, the planned expansion, which will add two new locks, one on the Atlantic Ocean side and the other on the Pacific. Another interesting parallel is the rivalry with Nicaragua. The US had originally planned to build a canal in Nicaragua to compete with a French-run canal in Panama, but eventually abandoned the idea. However, serious plans, of which Nicaragua's new foreign minister is a big proponent, aimed at building a Nicaraguan alternative to the Panama Canal still exist. Even the opening celebrations in August 1914 - dampened by the outbreak of the first world war - have some parallels with recent times. The 1999 handover of the canal from the US to Panama - much anticipated by some, feared by others - was a subdued event. The US government was represented only in a minor capacity due to fear of the impact of any canal debate on the US presidential campaign in 2000. Parker deserves praise for combining a wealth of information with well-written prose. The book is full of personal testimony and anecdotes, giving each step of the construction a human touch. As Panama embarks on the first major overhaul of the canal since it was opened, this book provides a fascinating and rewarding perspective. 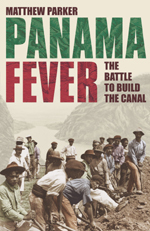 Panama Fever: the battle to build the canal, Matthew Parker, Hutchinson, £20, ISBN: 0-09179-704-7. Joachim Bamrud, editor-in-chief of Latin Business Chronicle, was a Panama correspondent for Reuters andUPI in the early 1990s.